From the author of the international bestseller Debt: The First 5,000 Years comes a revelatory account of the way bureaucracy rules our lives Where does the desire for endless rules, regulations, and bureaucracy come from? How did we come to spend so much of our time filling out forms? And is it really a cipher for state violence? To answer these questions, the anthropologist David Graeber--one of our most important and provocative thinkers--traces the peculiar and unexpected ways we relate to bureaucracy today, and reveals how it shapes our lives in ways we may not even notice...though he also suggests that there may be something perversely appealing--even romantic--about bureaucracy. Leaping from the ascendance of right-wing economics to the hidden meanings behind Sherlock Holmes and Batman, The Utopia of Rules is at once a powerful work of social theory in the tradition of Foucault and Marx, and an entertaining reckoning with popular culture that calls to mind Slavoj Zizek at his most accessible. An essential book for our times, The Utopia of Rules is sure to start a million conversations about the institutions that rule over us--and the better, freer world we should, perhaps, begin to imagine for ourselves. "A slim, sprightly, acerbic attack on capitalism's love affair with bureaucracy." "[The Utopia of Rules] should offer a challenge to us all. Should we just accept this bureaucracy as inevitable? Or is there a way to get rid of all those hours spent listening to bad call-centre music? Do policemen, academics, teachers and doctors really need to spend half their time filling in forms? Or can we imagine another world?" "Graeber wants us to unshackle ourselves from the limits imposed by bureaucracy, precisely so we can actually get down to openly and creatively arguing about our collective future. In other words, yelling at the book is not just part of the pleasure of reading it. It's part of the point." 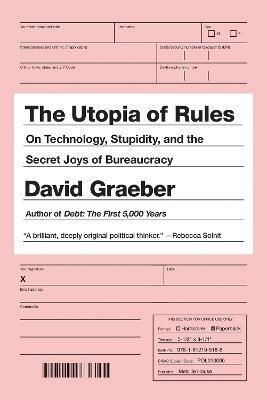 "Graeber's most interesting claim...is that our expressed hostility toward bureaucracy is at least partly disingenuous: that these thickets of rules and regulations are a source, to quote from his subtitle, of 'secret joys' for most of us." "Something like an intellectual hike led by an eccentric guide: a winding set of anecdotes, schematics, juxtapositions, and assertions... He is a master of opening up thought and stimulating debate." "What intense pleasure this book gave me, despite the dull topic: bureaucracy." "[A] fizzing, fabulous firecracker of a book... Our contemporary bureaucrats are revealed, in fact, as none other than you and me, forever administering and marketing ourselves." "Anthropologist Graeber is one of our wildest thinkers (see Debt: The First 5,000 Years), and in this book, he takes on the topic of bureaucracy, arguing that what we think of as the root of our civilization - capitalism, technology, rules and regulations - may just be what's keeping us in chains." "Inspiring and full of surprising facts... This is ultimately a book about how the systems we invent come to appear natural. We treat our world as though it is a fact, but actually, we produce it. This is not a new idea, but it's one of the most hopeful we've got. It opens the door to change." "A throughly argued, funny, and surprising new book." "Persuasive... Graeber's aim was to start a conversation on the boondoggles and benefits of bureaucracy. In that regard, he has ticked all the right boxes." "Packed with provocative observations and left-field scholarship. Ranging from witty analysis of comic-book narratives to penetrating discussion of world-changing technologies that haven't actually appeared, it demystifies some of the ruling shibboleths of our time. Modern bureaucracy embodies a view of the world as being essentially rational, but the roots of this vision, Graeber astutely observes, go all the way back to the ancient Pythagoreans." "Admirable and convincing...In his irrepressible, ruminative way, Graeber stands in the comic tradition of Walt Whitman, archy and mehitabel and James Thurber. This is the chorus with which to laugh the trousers off corporate management." "Interrogates aspects of bureaucratic modernity that are normally unexamined causes of annoyance... Stylish and witty." "Graeber is an American anthropologist with a winning combination of talents: he's a startlingly original thinker...able to convey complicated ideas with wit and clarity." "A sharp, oddly sympathetic and highly readable account of how big government works-or doesn't work, depending on your point of view." --Cory Doctorow, BoingBoing "[The Utopia of Rules] should offer a challenge to us all. Should we just accept this bureaucracy as inevitable? Or is there a way to get rid of all those hours spent listening to bad call-centre music? Do policemen, academics, teachers and doctors really need to spend half their time filling in forms? Or can we imagine another world?" --Gillian Tett, Financial Times "Graeber wants us to unshackle ourselves from the limits imposed by bureaucracy, precisely so we can actually get down to openly and creatively arguing about our collective future. In other words, yelling at the book is not just part of the pleasure of reading it. It's part of the point." --NPR "Graeber's most interesting claim...is that our expressed hostility toward bureaucracy is at least partly disingenuous: that these thickets of rules and regulations are a source, to quote from his subtitle, of 'secret joys' for most of us." --Oliver Burkeman, The Guardian (UK) "Something like an intellectual hike led by an eccentric guide: a winding set of anecdotes, schematics, juxtapositions, and assertions... He is a master of opening up thought and stimulating debate." --Boston Globe "What intense pleasure this book gave me, despite the dull topic: bureaucracy." --Peter Richardson, The National Memo "[A] fizzing, fabulous firecracker of a book... Our contemporary bureaucrats are revealed, in fact, as none other than you and me, forever administering and marketing ourselves." --The Literary Review "Anthropologist Graeber is one of our wildest thinkers (see Debt: The First 5,000 Years), and in this book, he takes on the topic of bureaucracy, arguing that what we think of as the root of our civilization -- capitalism, technology, rules and regulations -- may just be what's keeping us in chains." --Flavorwire, 10 Must Read Books for February "Inspiring and full of surprising facts... This is ultimately a book about how the systems we invent come to appear natural. We treat our world as though it is a fact, but actually, we produce it. This is not a new idea, but it's one of the most hopeful we've got. It opens the door to change." --Maclean's (Canada) "A throughly argued, funny, and surprising new book." --Jonathon Sturgeon, Flavorwire "Persuasive... Graeber's aim was to start a conversation on the boondoggles and benefits of bureaucracy. In that regard, he has ticked all the right boxes." --The Observer (UK) "Packed with provocative observations and left-field scholarship. Ranging from witty analysis of comic-book narratives to penetrating discussion of world-changing technologies that haven't actually appeared, it demystifies some of the ruling shibboleths of our time. Modern bureaucracy embodies a view of the world as being essentially rational, but the roots of this vision, Graeber astutely observes, go all the way back to the ancient Pythagoreans." --John Gray, The Guardian (UK) "Admirable and convincing...In his irrepressible, ruminative way, Graeber stands in the comic tradition of Walt Whitman, archy and mehitabel and James Thurber. This is the chorus with which to laugh the trousers off corporate management." --Times Higher Education (UK) "Interrogates aspects of bureaucratic modernity that are normally unexamined causes of annoyance... Stylish and witty." --Steven Poole, New Statesman (UK) "Graeber is an American anthropologist with a winning combination of talents: he's a startlingly original thinker...able to convey complicated ideas with wit and clarity." --The Telegraph (UK) "A sharp, oddly sympathetic and highly readable account of how big government works--or doesn't work, depending on your point of view." the nature of debt--where it came from and how it evolved." "An absolutely indispensable--and enormous--treatise on the history of money and its relationship to inequality in society."